Category Archives: Oscar’s First Foods! Oscar just turned 7 months old and has been really well behaved, so I surprised him with a birthday treat. Since Oscar loves peanut butter but only gets to eat it on special occasions, I chose ants on a log, a fun snack made with celery, peanut butter, and raisins. I waited until Oscar settled down for a nap and then surprised him with his birthday snack. Watch as Oscar wakes up to his birthday treat and see the peanut butter aftermath at the end. Enjoying Life, Oscar's First Foods! 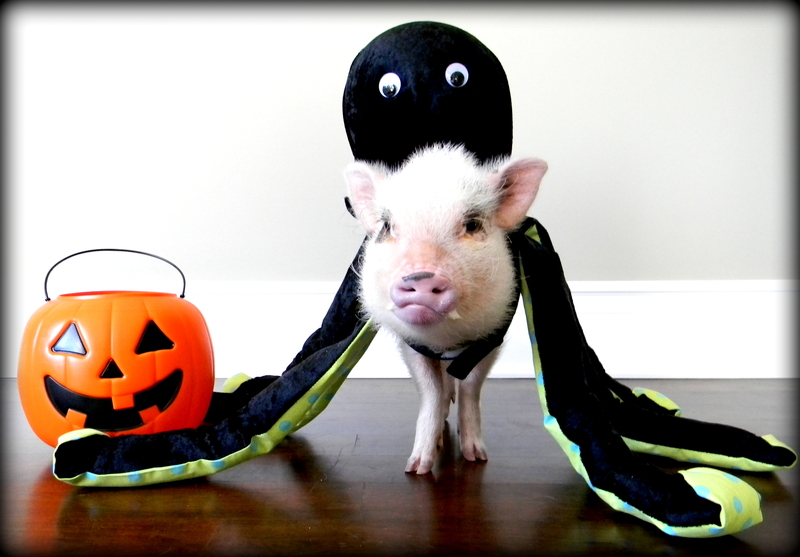 Happy Halloween from Mini Pig Oscar! Happy Halloween! 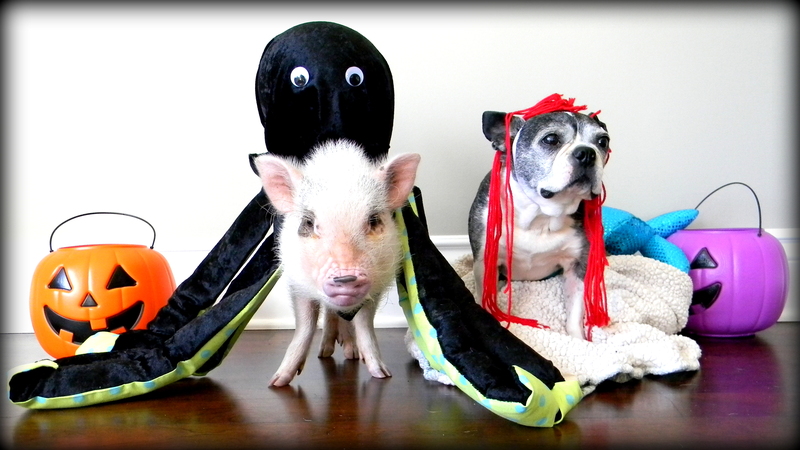 Oscar dressed up as an octopus for his very first Halloween! He was surprisingly happy to wear his costume, even with the tentacles swaying around him when he walked. 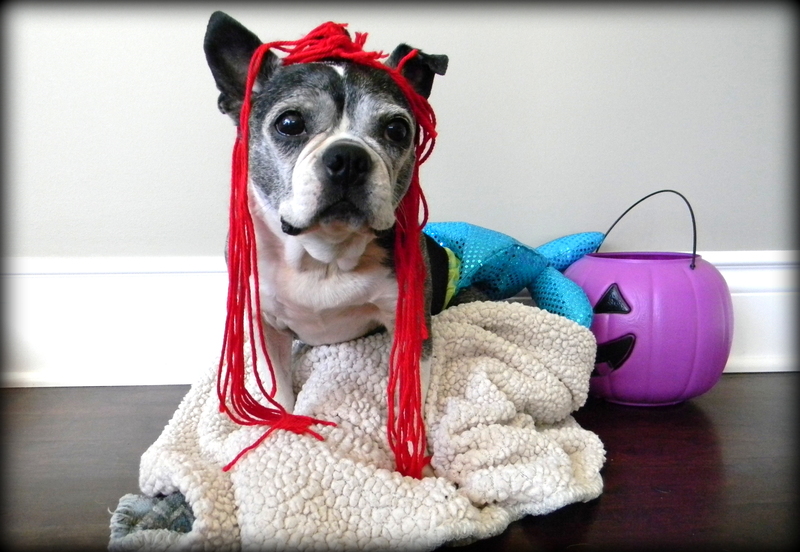 His dog sister, Rylee, dressed up as a mermaid and they made an adorable pair. As a special treat to celebrate, Oscar got to try his very first pumpkin carved into the shape of a fish! 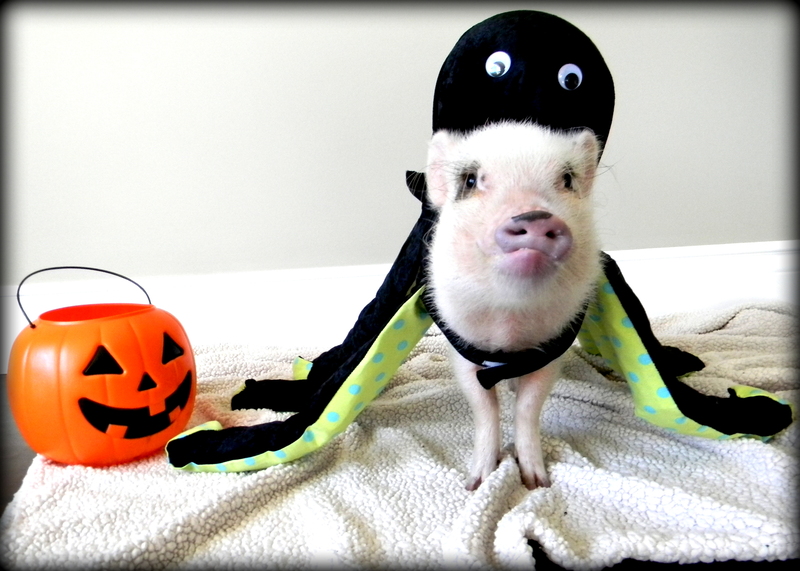 Here is the video of Oscar wearing his octopus costume while eating his first pumpkin. Oscar occasionally gets small side salads with his meals since vegetables are a great way for mini pigs to get extra nutrition and more food without too many calories. This weekend, Oscar’s dad made him a special salad with kale, carrots, oats, and beets. The beets were extra special because they were straight out of the garden that Oscar has been eyeing for a while, and it was Oscar’s first time trying beets. Oscar finished every last bite of his special salad! I’m thrilled that he loves vegetables because he gets all of the extra nutrition he needs while thinking it’s a tasty treat. Here is the video of Oscar enjoying his special salad. Oscar recently turned six months old, so we celebrated by throwing him a half birthday party. The birthday boy got a big surprise when we gave him his very first watermelon. Judging by his happy smacking sounds, I think he liked it! Watch as Oscar enjoys his very first watermelon at his half birthday party. Oscar recently tried his first peach, banana, and popsicle. He liked all three, but I really wanted to know which one was his favorite. To find out, I gave him all three at once and let him pick. In his last favorites video, it took Oscar a while to choose his favorite. This time, he knew immediately which one he wanted and picked it right away! We still switch up his treats for variety, but it’s nice knowing which foods are his favorites for those special treat times. Watch to see which food Oscar picks as his favorite. He even helps “mop” at the end!